Images of Wayne Rooney, Cristiano Ronaldo and Samuel Eto'o are still festooned on posters all over South Africa -- but sadly for them that's their only involvement as the World Cup reaches its final stages. Along with the likes of Didier Drogba of Ivory Coast, Lionel Messi of Argentina and Fernando Torres of Spain, they were supposed to score goals, lead by example and have a battle royal to prove themselves as the world's best player. It did not quite work out like that. Messi, who has had an excellent tournament so far without scoring a goal, and Torres, who has had an indifferent tournament without scoring either, are still involved with Argentina facing Germany in their quarter-final and Spain playing Paraguay in theirs. They still have time to leave an indelible mark on this World Cup but the chance has gone, for at least another four years, for Rooney and Ronaldo. For Drogba, who will be 36 in 2014 and Eto'o, who will be 33, the chance may have gone for good. Rooney undoubtedly had the worst World Cup of the lot. The build-up to the tournament in England was dominated by stories of how an-in form Rooney would lead England to the semi-finals at least. 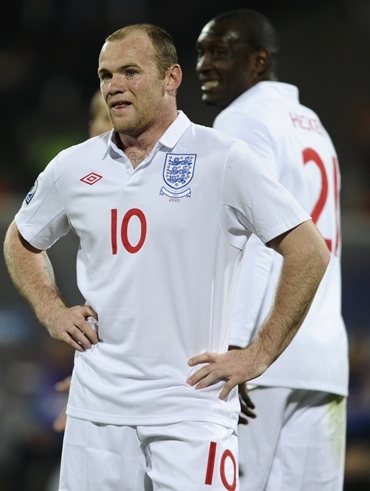 Rooney though, was never on form, played without a smile as if he would rather be anywhere else, and although he came close to a goal in England's final Group C match against Slovenia, he had a miserable sullen campaign. It was summed up by a wild, ludicrous "shot" at goal during England's 4-1 second round defeat to Germany in Bloemfontein when his effort appeared to be heading for the landlocked nation of Lesotho 80 miles away rather than the back of the German net. Rooney's old Manchester United team mate Cristiano Ronaldo, the world's most expensive player, also rarely rose above the mediocre. He came close to starting the tournament in glory with a long-distance strike that crashed against the Ivory Coast post and was mostly ineffective for the rest of that game. He did shine, though, in the 7-0 rout of the North Koreans, firing shots against the bar, the side netting and the keeper as well as making some delightful passes and breaking his long dry spell for the national side with a comical late goal. With Portugal's defensive approach in the final group game against Brazil, the winger saw little of the ball and, excepting the odd useful pass, his threat was nullified by imposing centre back Lucio. The second round tie against the Spaniards offered Ronaldo a great chance to shine but Portugal's direct method to counter their opponents' passing game left him with little service and his main chance came from a fierce, swerving free kick that Iker Casillas struggled to defend. Frustrated by not being able to make darting runs and with his free kicks mostly flying into the stands, Ronaldo spent most of the tournament pouting. His tournament ended sourly after he told journalists to "speak to Carlos Queiroz" when asked to explain the loss to Spain and then had to retract the comments in a statement. Spain's Torres came in direct opposition to Ronaldo on Tuesday, with coach Vicente del Bosque deploying him in a two-pronged attack with strike partner David Villa. After returning from knee surgery shortly before the tournament, he has been totally outshone by Villa, who has netted four in four matches to draw to within two of Raul's national scoring record of 44. 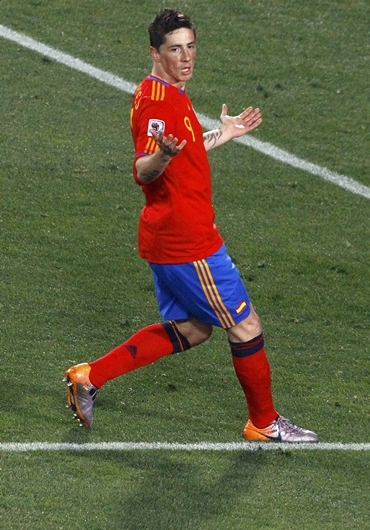 Torres looks to be lacking the pace and strength that have made him such a terror for defenders in the past and is a shadow of the player who scored the brilliant winning goal in the Euro 2008 final against Germany. "It's not easy coming back after an operation," the 26-year-old said last weekend. "I think I still have a little way to go before I am back at 100 percent, although I am close." Torres at least, like Messi, is still involved. Messi, the World Player of the Year, has had a series of excellent games with Argentina seemingly on course for a final showdown with Brazil. Of all the "poster boys" Messi still has the chance to etch his name on the finals just as Diego Maradona did in 1986. The two big African stars of the pre-tournament build-up had moderate successes, even though their teams failed to survive the group stage. 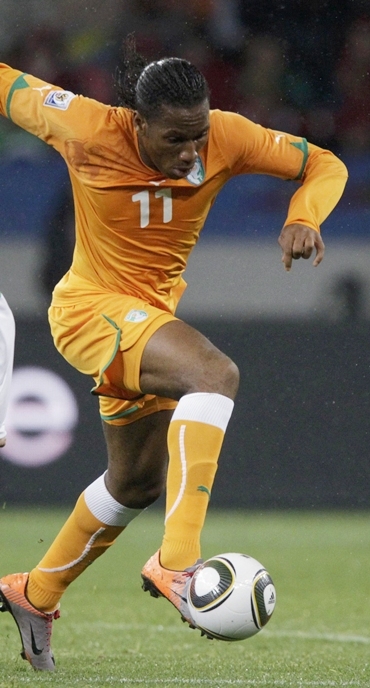 Drogba played with a protective cast for Ivory Coast after fracturing his arm before the tournament, and at least had the satisfaction of becoming the first African to score a goal against Brazil in the World Cup when he netted in their 3-1 defeat at Soccer City. 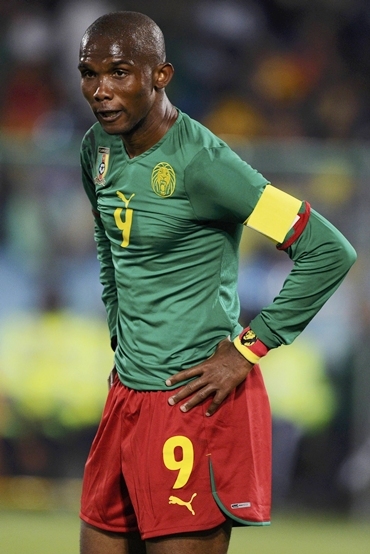 Cameroonian Eto'o managed to get on the scoresheet twice before his side also exited at the group stage. They never came close to emulating the 1990 Roger Milla campaign and will be remembered among the footnotes when the story of this tournament is recalled in the history books.